Longmont, CO – The complete Nitro package is here – Milk Stout Nitro is available in draft, bottle and new in 2017… nitro cans! 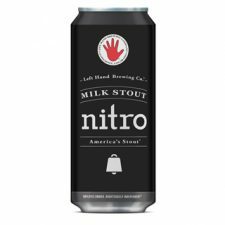 This year, Left Hand Brewing Co. will introduce Milk Stout Nitro cans to the definitive Nitro series, making Left Hand’s most popular and influential beer more accessible than ever. Nitro fans can take the beer on the go and drink a perfectly smooth and creamy Milk Stout Nitro from the can. The first of its kind from an American craft brewery – Left Hand pioneered the way for beer drinkers to enjoy a Nitro draft-like experience at home, releasing Milk Stout Nitro bottles in 2011 and evolving into a benchmark for the style. While a glass is always recommended for the perfect pint, especially when you #PourHard a Nitro bottle, cans bring a greater drinking versatility, and bring Milk Stout Nitro to your lips with the crack of a can. Milk Stout Nitro cans will be released later this year, available across the brewery’s 40 state footprint along with Milk Stout Nitro bottles, Nitro seasonals and draft.